You know that donuts don’t make the best breakfast choice, and you probably limit your dessert indulgences to special occasions. But even with your healthy habits, you might be eating much more sugar than you realize. Due to the growth of the processed food industry, sugary snacks and drinks are now more accessible than ever before. Of the 600,000 different processed food items sold in America, a staggering 80% contain added sugars. It’s often easier (and cheaper) to reach for these processed foods instead of fruits and vegetables when we are hungry. Unfortunately, this has led to an unprecedented rise in added sugar consumption for adults and children alike, making us vulnerable to serious health issues. Processed foods contain high levels of added sugars that your body absolutely does not need. 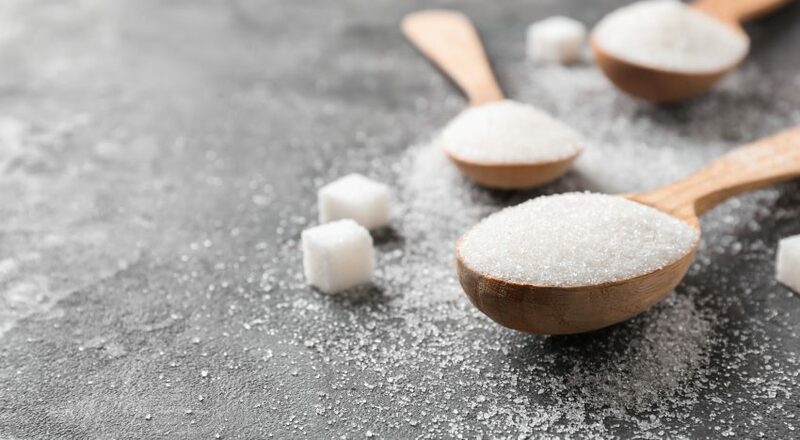 These sugars wreak havoc on your body and cause health problems that range from fatigue and weight gain to diabetes and cardiovascular disease. So how can you restore balance to your body and escape the uncomfortable and dangerous consequences of eating too much sugar? You need to learn how to detox from sugar. This guide will teach you everything you need to know about sugar, its role in your body, and the best ways to detox from such an addictive substance. Are There Different Types of Sugar? Sugars are sweet carbohydrates that provide energy for the body, but not all sugars are alike. They generally fall into two categories: unrefined and processed. Unrefined sugars are found in whole foods that naturally contain sugar, including fruit, vegetables, and legumes. Eating a limited amount of unrefined sugars from whole foods provides stable energy for your body and keeps your blood sugar balanced. Processed sugars, on the other hand, are bad news. They are added to refined foods like soda, candy, crackers, and white bread and lead to a wide range of health consequences. Glucose is a simple sugar that the body uses for energy. It’s mainly found in carbohydrate-rich food like bread, fruit, and potatoes. All glucose is absorbed into the intestines and passes into the bloodstream, where insulin must be released to transport glucose into your cells. Insulin helps glucose move inside muscle, fat, and liver cells to provide fuel. This is a natural process, but today’s processed foods cause most people to have too much glucose in their blood. Excess glucose causes insulin levels to spike in an effort to process so much sugar. If you eat too much sugar day after day, week after week, your poorly regulated blood glucose levels will cause your blood to thicken. Thick blood makes the heart work harder and makes the body more vulnerable to heart attack, stroke, vision problems, nerve problems, and more. 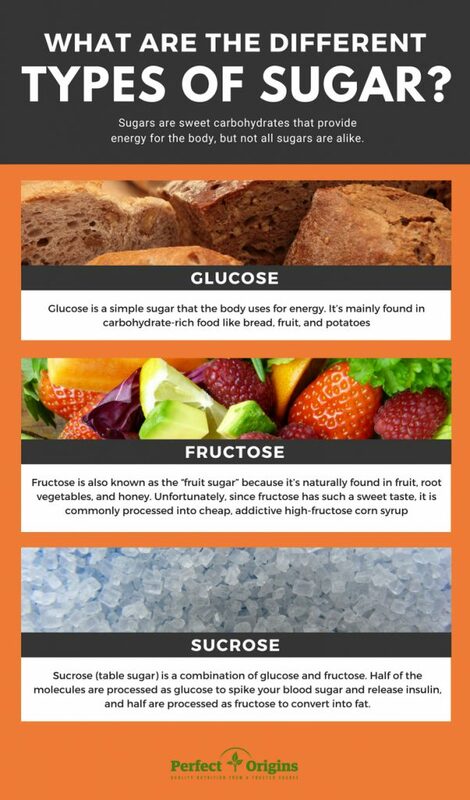 Fructose is also known as the “fruit sugar” because it’s naturally found in fruit, root vegetables, and honey. Unfortunately, since fructose has such a sweet taste, it is commonly processed into cheap, addictive high-fructose corn syrup and added to everything from salad dressing to cereal. The body does not prefer fructose as a source of energy, so it turns directly into fat and sticks to your belly. Sucrose, also known as table sugar, is a combination of glucose and fructose. If you add sucrose to your coffee in the morning, half of the molecules are processed as glucose to spike your blood sugar and release insulin, and half are processed as fructose to convert into fat. How Is Sugar Dangerous to Your Health? The average American now eats 77 pounds of added sugar annually, compared to just four pounds of sugar annually in the 18th century. It’s no wonder we are suffering from the effects of sugar overload! Sugar itself is not poisonous, but it acts like a poison in the body when eaten in such large quantities. The truth is that sugar can hurt nearly every organ system in the body and cause a wide range of health problems. Eating high quantities of added sugar causes ongoing weight gain and belly fat accumulation. Your body can only store a limited quantity of sugars before they are converted into fat. Worse yet, the fructose sugars in items like candy, soda, breads, and juice metabolize into fat immediately. Research demonstrates a clear link between high-sugar diets and an increased risk of heart disease and diabetes. In one 2014 study published in JAMA Internal Medicine, experts found that people who ate 17% to 21% of their calories from added sugar had a 38% higher risk of dying from cardiovascular disease than those consuming less added sugar. This is because the side effects of excess sugar like inflammation, obesity, high triglyceride levels, and high blood sugar levels combine to cause significant damage to the heart. Pre-diabetes and type 2 diabetes are also serious health problems known to develop as a result of too much sugar in the body. As more sugar sneaks into your diet, more fat accumulates on your body. Sugary foods and How to detox from sugardrinks also cause blood sugar levels to spike and deprive your body of the energy it needs to exercise or plan wholesome, healthy meals. As a result, your body systems become vulnerable to the development of diabetes. We all know that sugar’s sweet taste is delicious, but that comes at a cost. Every time you eat sugar, it stimulates the release of dopamine in the brain. Dopamine is the hormone associated with pleasure and rewards. The spike of dopamine that you experience when eating a brownie gives you that satisfying “high,” but the euphoria is fleeting. After that initial sugar rush, you are left coping with the effects of a sugar crash. Minerals are pulled from your bones, teeth, and other parts of your body to help metabolize so much sugar. This causes nutrient deficiencies that zap your body of its energy and interrupt important functions. At the same time, your cravings for more sugar and another dopamine “high” leave you feeling irritable and emotional. It’s enough to ask yourself… was that brownie really worth it? 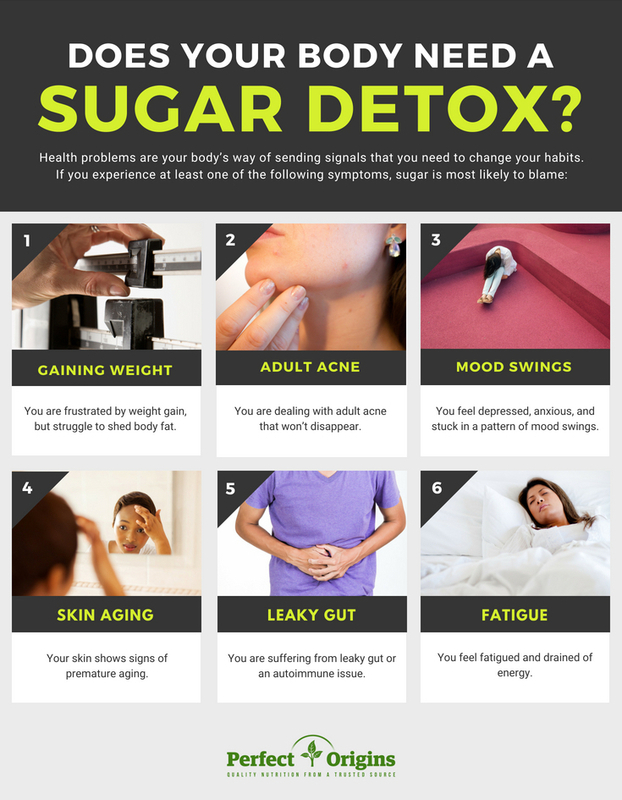 What Are the Signs Your Body Needs a Sugar Detox? You are frustrated by weight gain, but struggle to shed body fat. You are dealing with adult acne that won’t disappear. You often feel depressed, anxious, and stuck in a pattern of mood swings. Your skin shows signs of premature aging. You feel fatigued and drained of energy. 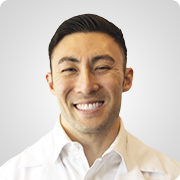 You are suffering from leaky gut or an autoimmune issue. What Should You Expect During Your Sugar Detox? Like any detoxification process, the beginning of a sugar detox might feel like it’s hurting your body more than helping. It’s important to trust the process and persevere! 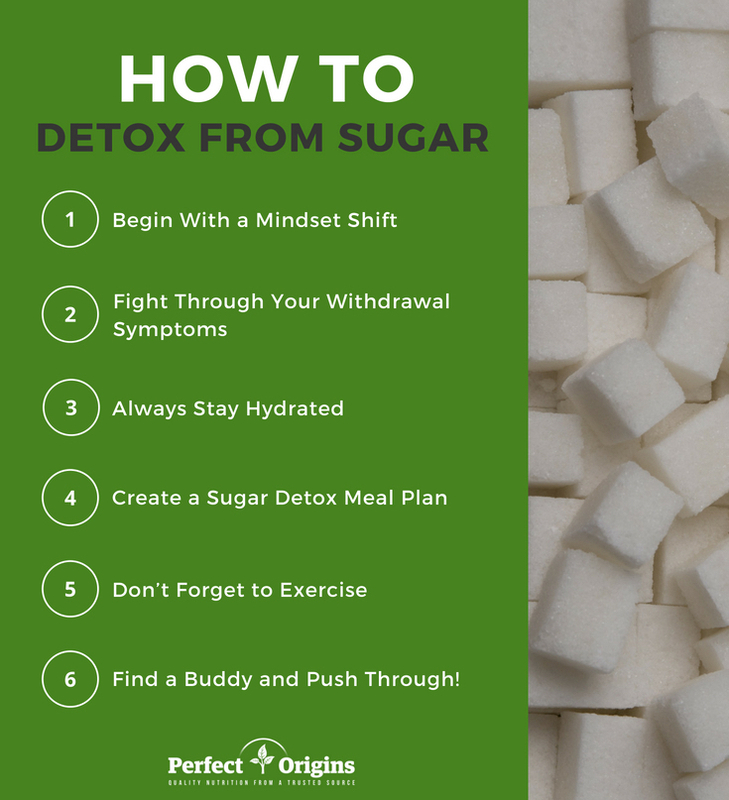 The withdrawal symptoms you experience during the first days of a sugar detox occur because your body is learning to function without sugar while it removes toxins. Your system needs time to learn to balance itself without the presence of sugar. You can expect to endure headaches, fatigue, bad breath, and even gastrointestinal distress for the first three to five days. The good news is that these symptoms won’t last long. Your body will learn to utilize other sources of energy and you will quickly begin to enjoy the numerous benefits of a sugar detox. More energy: No more sugar highs and crashes to leave you feeling lethargic. Instead, you can take charge of your life with sustainable energy levels. Weight loss: You will lose water weight quickly once you remove added sugars from your eating habits. This weight loss will continue because you won’t have excess sugar stored in the body as fat. Look and feel better: After a few weeks of your sugar detox, your skin will take on a healthier glow, your bloating will disappear, and you will feel like a revitalized and rejuvenated version of yourself! Read on to learn more about the specific steps required for a sugar detox. You are within just a few weeks of shedding your health problems — and extra weight — and embracing lasting health and wellness. You now know exactly how sugar harms your health, so what is the best way to overcome sugar addiction and recalibrate your body to thrive without so much sugar? A sugar detox will help you escape your dangerous sweet tooth and learn to incorporate healthier whole foods into your eating routine. However, cutting out sugar isn’t exactly a cake walk due to sugar detox side effects, so this guide is designed to set you up for success. Improve Your Liver Health NOW! Do you have stubborn fat? Are you stuck on a plateau where no matter what you do, you just can’t lose weight? CLICK HERE TO LEARN MORE ABOUT LIVLEAN. Our lives revolve around food. We go out to dinner with friends, make huge meals in the kitchen, and stock up on snacks before a movie begins. In order to experience success with your first sugar detox, it is important to change your mindset about food. Before you begin to cut your sugar intake, you must separate the processes of eating for pleasure and eating for results. Eating for results helps you focus on cutting harmful sugar from your body, while eating for pleasure is a meaningful experience shared with family and friends on special occasions. An “eat for pleasure” mindset will undermine your sugar detox efforts. You’ll feel frustrated by the perceived need to deprive yourself of your favorite treats. As soon as you can establish an “eat for results” mindset, you’ll have the determination and focus needed to battle your cravings and replace processed carbohydrates with nutritious whole foods. The first step of your detox from sugar involves cutting your carbohydrates down to 25 grams a day for a minimum of one month. A standard 2,000-calorie diet usually includes at least 250 grams of carbohydrates, so this dramatic decrease will initially startle your body. Sugar acts like a drug in your body, so cutting down on sugar is guaranteed to cause temporary withdrawal symptoms. This is known as the Herxheimer Reaction. The body feels worse, not better, for the first few days or weeks as bacteria, parasites, viruses, and other pathogens are killed off and removed from the body. Don’t worry, your symptoms like nausea, headaches, bad breath, joint pain, and irritability show your sugar detox is working! 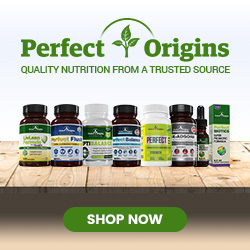 Your body needs time to detoxify, adapt, and learn to function without sugar as a crutch. Staying hydrated is a critical component of your sugar detox from start to finish. You will shed water weight quickly during your detox since sugars tend to hold excess water. This water weight loss is exciting because you will look and feel thinner, but it can cause dehydration if you aren’t careful. Put a pinch of sea salt into your water. Purchase trace mineral drops to add into your water. Squeeze a lemon into your water. As an added bonus, drinking plenty of water will stave off sugar cravings and help you combat initial sugar withdrawal symptoms. You are beginning the process of cutting your carbohydrate intake from 250 grams per day to 25 grams per day, so a meal plan is necessary for strategic success. Begin by removing temptations from your fridge, freezer, and cabinets. Most packaged, canned, and processed frozen foods can go straight into the trash can. This includes sources that you might not expect to contain sugar, like potato chips. Go grocery shopping to replenish your kitchen with lean meats, fish, eggs, vegetables, fruits, nuts, and seeds. Your breakfast plays a major role in your overall energy level and mood for the rest of the day, especially during a sugar detox. Pack protein into your breakfast to feel satisfied without a blood sugar spike. Your body will gradually learn to use that protein as energy instead of sugar, and you’ll be amazed by how much better you feel each day! A protein shake, eggs with bacon, or Greek yogurt with nuts are all satisfying options. It’s not enough to simply cut sugars and carbohydrates from your diet during a sugar detox. Make sure you replace them with healthy fats. The fats found in nuts, seeds, olive oil, wild-caught seafood, eggs, pasture-raised meats, and avocados keep your blood sugar levels balanced, help you feel satisfied after a meal, and ensure your body absorbs vitamins and nutrients properly. You get to enjoy 25 carbohydrates each day of your sugar detox, so make them worth it! Nutritious complex carbohydrates will help you sustain your progress and resist further temptations. Opt for rice, lentils, sweet potato, or berries instead of pasta or a baked potato. Movement is life and life is movement. Exercise should be included as a core component of your sugar detox to keep your blood sugar levels steady. Your muscles utilize glucose during and after strength training, which detracts glucose from your bloodstream and results in fewer cravings. Furthermore, lean muscles support the body’s efforts to transform blood glucose into energy. This means that regular exercise not only makes your sugar detox easier, but it also optimizes your body’s use of sugar after your detox concludes. Find a Buddy and Push Through! Your sugar detox doesn’t have to be perfect. You might fall off the bandwagon or cheat with that delicious pie your mom makes every Thanksgiving. It’s okay! Forgive yourself, recognize you ate too much sugar, and push to do better the next time you feel tempted. It’s also helpful to educate yourself – reading a post like this is a significant step in the right direction. Take ownership of your health and commit to improving not just your health but your overall quality of life. Try detoxing from sugar with a buddy like your spouse or friend. This offers accountability and a desire to achieve success. Your dedication will be worth it at the end of your sugar detox when you are liberated from your sugar addiction and free to experience a full, energized, and revitalized life. Collagen for Joints: Can Collagen Reduce Joint Pain? Keep us updated on how you do with your progress and let us know if you have any questions! Best of luck!